Eltronicschool. - This is one of the adjustable power supply module for you who want to get adjustable stable DC output for your electronic circuit this time. 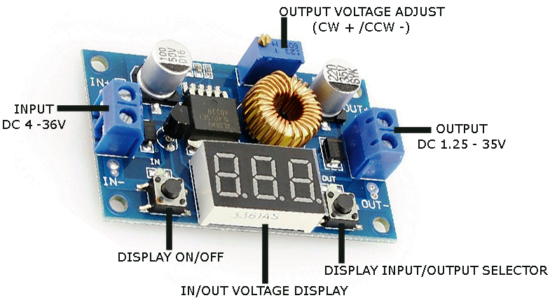 This is Adjustable Power Supply Module using XL4015 IC for you. In this time beside we will give you the description of this circuit, we also will give you the circuit schematic Adjustable Power Supply Module using XL4015 IC and also the real shape of this module. 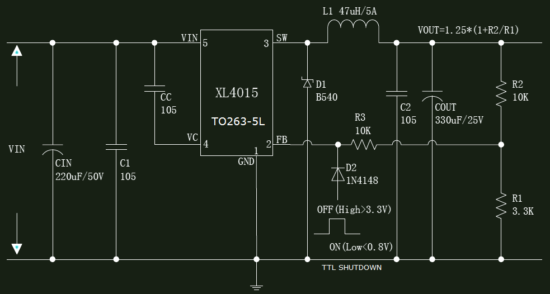 Circuit schematic like in Figure 1 above is Adjustable Power Supply Module using XL4015 IC. According Electroscheamtics blog describe that power up the module with a stable and accurate dc power supply (such as a regulated 6-V power supply). Then short-press the button on the right side to select which one you need to adjust (input or output). Long-pressing the button on the right side (holding it for >2 s) makes the module enter calibration mode. After releasing the button, the related LED will blink to indicate which voltage is now calibrating, and the numeric display will blink with the present value. Short-press the button to change the present value. For example, if your power supply is 6 V but the result of voltage meter is 5.8 V, you need to set the value to 6 V.
Short-press the button on the right side to increase the voltage by one unit. Short-press the button on the left side to reduce the voltage by one unit. Long-press button on the right side to store the redressed value. The preset pot sets the actual output voltage. Calibrate the output voltage reading on the digital voltmeter in the same way above. For example, if your actual output is 3 V but the result on the voltmeter is 4 V, you need to set the value to 3 V. The redressed value will be stored in the non-volatile memory of the module.